How many calories in Eggplant? See below, the Eggplant or Aubergine calories for the different serving sizes. We provide you with the Eggplant nutrition facts and the health benefits of Eggplant to help you to lose weight and eat a healthy diet. The Eggplant is also known as Aubergine, Melongene, Brinjal, or Guinea Squash. The Eggplant or Aubergine has several varieties, although probably the most popular is dark purple with a round oblong shape. The vegetable can be cooked a number of ways including roasting and stewing. It does contain nicotine, although you would need to eat a lot of it, 9 kilos in fact, to match the same amount as one cigarette. 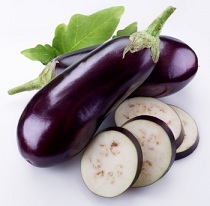 Eggplant is high in both fiber and manganese and very low in fat. It provides plenty of other vitamins and minerals including thiamine (B1), riboflavin (B2), niacin (B3), pantothenic acid (B6), folic acid and vitamin C.
There are many Eggplant benefits. It is low on the glycemic index, about 15. It is recommended by the American Diabetes Association for management of Type 2 Diabetes given its high fiber, low carb content. Some studies have shown it to lower cholesterol whilst others have not. In addition, with the skin, the vegetable is also high in phenolic compounds which act as antioxidants. Below we have three calorie tables, depending on how you prepare and eat this vegetable. We also have a nutrition table comparing the nutrient levels when cooked and when raw. Compare the nutrition and calories in Eggplant with the calories in other vegetable varieties. This eggplant or aubergine salad recipe is diabetes appropriate, gluten free and vegetarian. It is low in: calories, cholesterol carbohydrates and is a good source of calcium, fiber and phosphorus. There are 199 calories and 8g of net carbs per portion.